I’ve been a little MIA folks and for good reason.. we welcomed our little miracle Van Connor into the world back on the 27th of May. It’s been quite the journey but we're so blessed to finally have our boy home with us. I make them impatient, Van a little more so then his sister. Born at 31 weeks + 5 days, we spent about a month and a half in and out of the Neonatal Intensive Care Unit at John Hunter Hospital, where our boy received the most professional, gentle and loving care our family could have ever hoped for. There’s not a nurse or volunteer on the NICU ward who doesn’t love what they do and they are all saints in our eyes! The night Van as born unfolded as fast as lightening. I'm certain we wouldn't have made it to the delivery suites had I not already been in admitted to hospital. Blake arrived just in time to have his hand turned to mush as I clung on for dear life through the ring of fire. Van came out lungs blaring, a huge relief! I reached out and popped him on my chest for a quick cuddle before the NICU nurse took him to check him over. It didn't take long for his cries to turn into a gurgling sound, a sign that he was struggling to breathe on his own. Van and Blake were off to the nursery and I was left in the delivery suite for what felt like eternity to be monitored over the next hour, thankfully Blake was keeping me updated every couple of minutes and my midwife was a witty, kind and positive superwoman who kept my delusional-self sane for the duration of that blurry wait. Despite spending the last hour counting down the minutes, I was overwhelmingly nervous when the time came to see Van. I fussed around unpacking and repacking my things, took a long shower and was shakey as hell as I tried to pull myself together. Due to threatened preterm labor from 26 weeks (thanks to a shortened cervix) I had a lot of time to mentally prepare myself for this moment which I think is why I remember it being really beautiful. I was just so relieved that he had made it here safely that I seen past all the distracting monitors and machines attached to his tiny frame and seen this little 1.7kg bundle of perfection. It was quite the cocktail of emotions when I held Van for the first time. 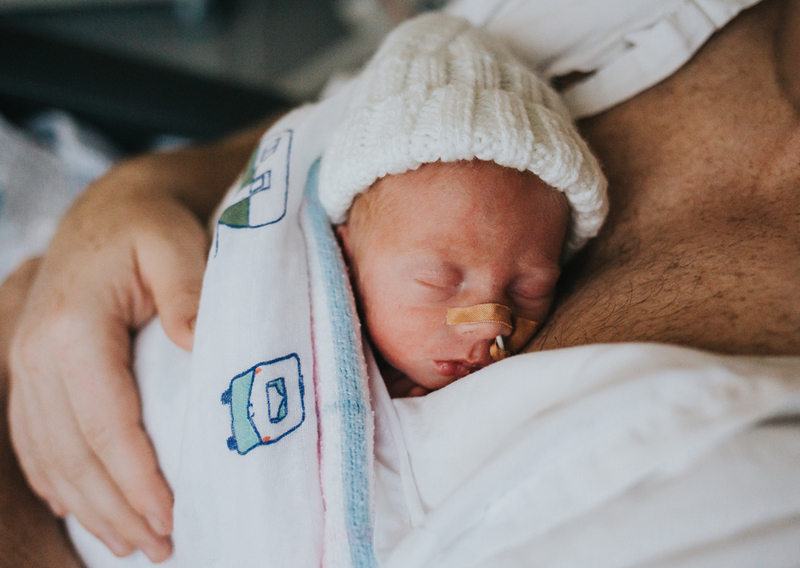 Skin-to-skin I could hear and feel the bubbles from the CPAP against my chest as the air entered and opened up his little lungs, a subtle reminder that my boy had more growing to do and was not yet strong enough to get by in this world without medical assistance. After a few days of my own recovery in the hospital it was time for me to return home and leave my little fighter in the trustworthy hands of the NICU staff. Whilst I knew he was in the best hands possible it ripped my heart out returning from hospital with empty arms. A little warm body quickly filled those empty arms whenever I arrived home. My daughter was missing her mummy and the guilt followed me everywhere, when I was at the hospital I was missing Lennon, when I was at home I was missing Van. It goes against all your natural instincts to leave your baby behind in a hospital and I wouldn't wish it upon anyone. For the first week or so we could only get Van out for one kangaroo care cuddle a day, which meant there were days I couldn't hold my boy as I knew it was important to share this special time with his daddy. One of the ultimate special moments was when Lennon met her new baby brother, I'll never forget it. She smooched every inch of that humidicrib and gave it her all to try and hug him through it. Nearly 3 months on and she's still totally smitten, always invading his personal space and smothering him in affection. Van was flying through his NICU milestones. He was off CPAP after 4 days and after a few more days he was moved from Intensive Care to the Special Care room where he would continue to grow big and strong. 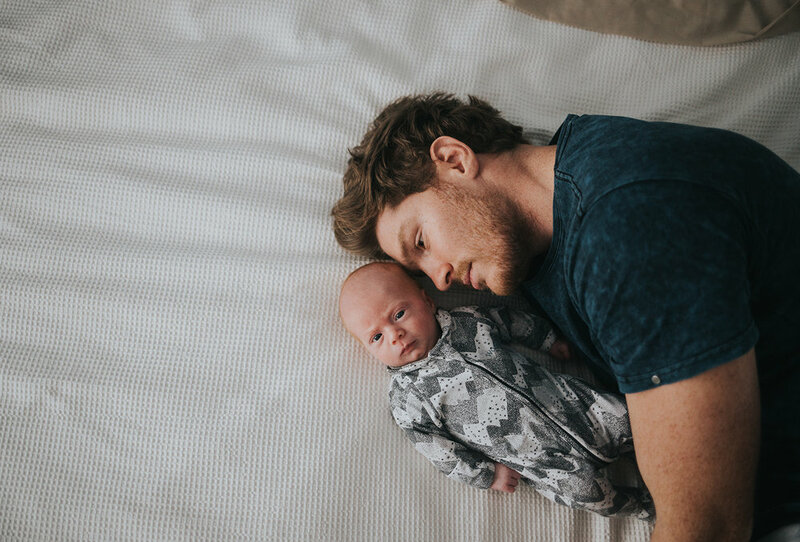 I wasn't long until Mr Impatient was latching on for breastfeeds well in advance for his corrected gestational age, gaining weight and moving into an open crib. There was a skip in my step for days after this one! Everything seems 10000% better, easier and more natural when your babe moves to an open crib. The nappy changes are easier, the cuddles are more frequent, you can study their face endlessly and there's no more gawking through a clinical plastic box. Van was up to 5 breastfeeds a day, every 3 hours and tube/bottle through the night. The 5 trips back and forth to the hospital a day were draining, but living so close meant Blake and I could juggle our time between the two kids and we were so fortunate to have that luxury. Everything was going smoothly and home time was in reach, until from from no where Van took a turn and required oxygen for a few days. A relatively small hiccup, but it was a hard one to mentally cope with when we'd built our hopes up so high to be bringing him home. Finally, after one whole month we got to take our boy home. Our little family were all together and the happiest we'd all been in months... but the cruel viruses of Winter decided to make a very unwelcome appearance at our household. Van's taste of freedom was scarce, we had only had him home for 6 days before we had to rush him back to hospital. Tests came back positive for RSV bronchiolitis and we were warned the worst was yet to come. It was back to square one in a humidicrib, tube feeds, high flow oxygen and lots of suctions to clear his airways. This time round he was too sick to get out of the crib at all and I was completely shattered. Never in my life have I felt so helpless. He needed to be in his mumma's arms more then ever and all I could do was watch on next to his crib as he rode out the worst of it in isolation. A cruel reminder to stay away from newborns if you're sick!! After 5 days he finally built up enough strength and energy to begin to wake up. The worst was behind him and he got stronger each day. At long last we finally got to bring our healthy strong boy home.. for good! Our hearts are full and we are so SO proud of this little fighter of ours. Just look at Blake and his babies the day after we brought Van home.. SWOOOOOOON! Big thanks and love to our village of family and friends who are helping us raise our kids! Those of you who helped take the stresses out of every day life so our family could focus on the important stuff, we really are so lucky and will be forever grateful. A special thanks to my beautiful mum, best friend Steph and of course my partner Blake, all of who were there through all the emotional turmoil of this chapter and with me every step of the way.